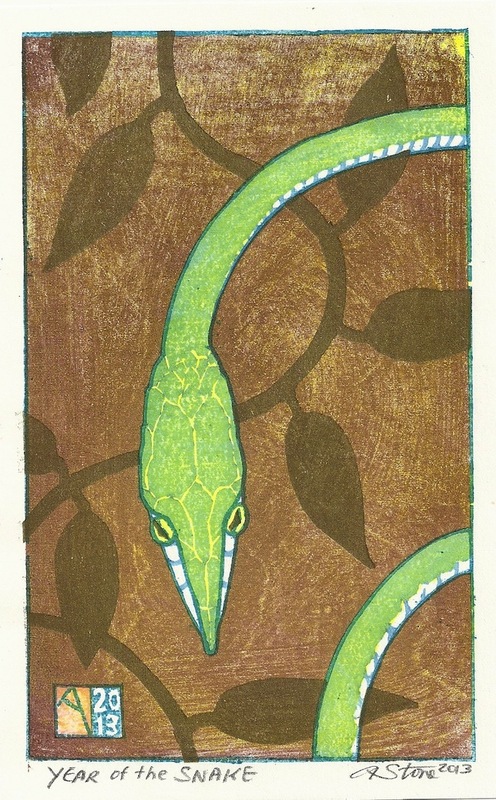 Well, I finished printing 85 small, vine snake, woodblock prints today. I had two bad prints--one with the classic error of flipping the print and printing one block upside down and another that shifted slightly during the printing of the keyblock. There are also quite a few "outliers"; prints that are just fairly different from the rest; Some are more yellow; some more brown. Some of my backgrounds didn't print evenly and when I reprinted them the doubling of pigment made for a much deeper and darker background. The same is true of the snake. Since his "GREEN" is really pthalo blue glazed thinly over a strong yellow---when I printed him a little unevenly and had to reprint it it became much more blue-green. But all-in-all there are only 2-3 real rejects and since it wasn't long ago that my reject rate was nearly 50% I've made progress in both my carving and printing. 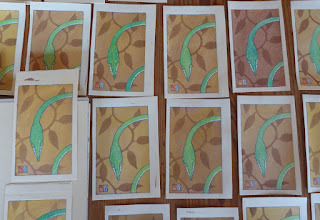 40 were printed on Awagami Kozoshi--a machine made hemp and kozo paper that I got a while ago from Daniel Smith and these will go out to the Baren Forum's Chinese New Year/Zodiac exchange. A 90g/m2 paper fairly white paper, they printed pretty well but are a little more "flat" than the others. 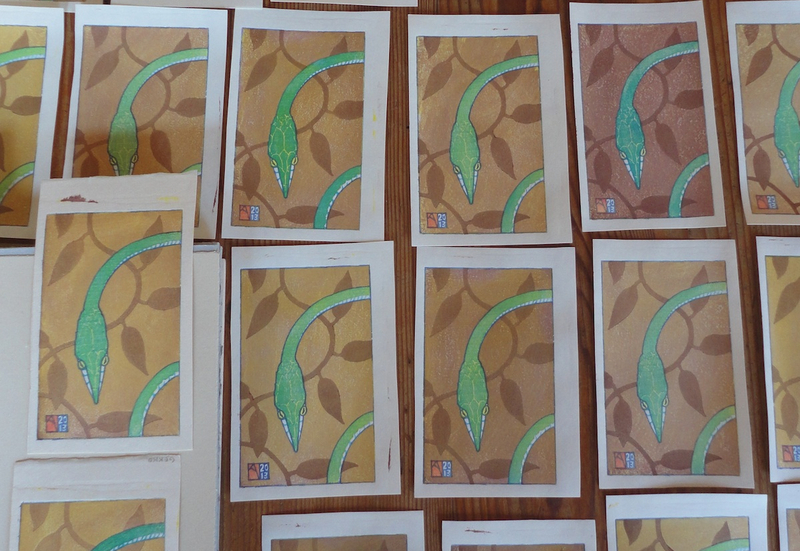 Another 18 were printed on my home-sized Hosokawa paper to see how they would print. Another 20 were printed on a machine-made, roll kozo paper from the Japanese paper place in Toronto. And I printed 6 on a small strip of Gekko Paper from Woodlike Matsumura which printed amazingly gorgeous but was almost impossible to print by hand (25Monme) very, very, thick and strong kozo. I won't try printing on it again as it really was too hard. I just finished layering the finished prints between blotter sheets and epsom board and weighted them to get them to dry flat. Happy to be done printing although I suspect I will print another run to get to an edition varie' of about 150 or so. But I'm taking a little break first to rest. Here's the version with the scrolling leaf/vine printed last--there's some bronze powder in the final leaf impression so it has a kind of printed-fabric look. I may try to tweak the warmth of the background and leaf pattern but it's pretty close to what I had in mind. Although it is a "final" proof, I often veer off when I'm actually printing so we shall see how much the final effort differs. But I think this will be pretty close. I cut, dampened and started printing on a stack of about 80 sheets of washi today. The first color (yellow) is down. Today (Feb 10th) is the start of the Chinese New Year. Happy 2013 and Year of the Snake.